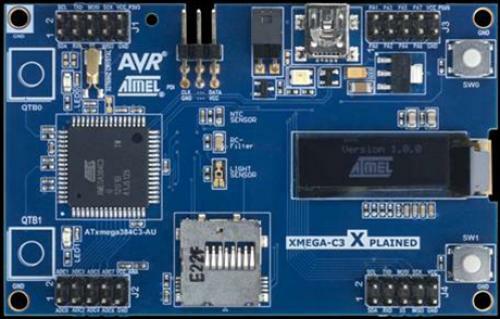 The Atmel XMEGA-C3 Xplained evaluation kit is a hardware platform for evaluating the Atmel ATxmega384C3 microcontroller. The kit offers a range of features that enable the Atmel AVR XMEGA user to get started using AVR XMEGA peripherals right away and understand how to integrate the AVR XMEGA device in their own design. The high-performance, low-power 8/16-bit AVR XMEGA microcontroller combines 384KB in-system programmable flash memory (8KB boot code section) with read-while-write capabilities, 4KB EEPROM, 32KB SRAM, a two-channel DMA controller, a four-channel event system, a programmable multi-level interrupt controller, 50 general purpose I/O lines, a 16-bit real time counter, five flexible 16-bit timer/counters with compare, compare and PWM channels, USB Full-speed Device, three USARTs, two two-wire interfaces, two serial peripheral interfaces, one 16-channel/12-bit ADC programmable gain, two analog comparators with window mode, a programmable watchdog timer with separate internal oscillator, accurate internal oscillators with PLL and prescaler, and a programmable brown-out detection.